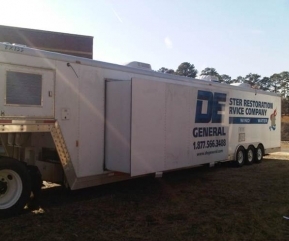 Step 3: Executing The Plan | DE General is the Southeast region’s premier disaster restoration company for both commercial and residential losses. From Broken To Better Than Ever. Once the project is approved, DE General will manage all aspects of the restoration process until its completion, inspection and your final satisfaction. We secure the proper construction permits and subcontractor agreements as well as budget for issues that we often encounter with complicated jobs. DE General will act as the key point of contact with your insurance adjustor, successfully and efficiently guiding your project through the claims process. Finally, DE General will coordinate the final inspection of the reconstruction to ensure it passes code and that you are completely satisfied with the result. We understand the trauma that such a loss can take on you and your organization and it gives us great satisfaction to see your property restored better than ever.